Enova Unites with Chicago Cares - Enova International, Inc. The Enova Gives program has resulted in partnerships with a host of generous nonprofit organizations, including Big Brothers Big Sisters, A Safe Haven and the Children’s Research Fund, to name a few. Now, we can add one more group to that list — Chicago Cares. Committed to building a better community through volunteerism, Chicago Cares creates opportunities throughout the city for individuals and teams looking to give something back. Since 1991, Chicago Cares has organized over 34,000 volunteers per year to provide assistance to nonprofits and schools all around Chicago. 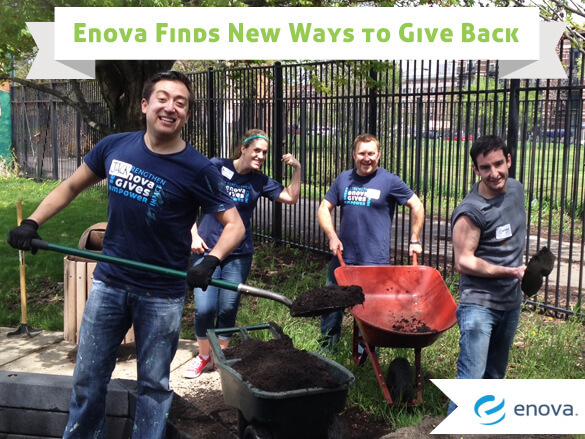 Apart from the monthly volunteer opportunities that Enova employees can take part in, Enova will also be supporting the Serve-a-thon, an annual day of service held each year by Chicago Cares. This year’s Serve-a-thon will take place on June 7, with over 5,000 volunteers working to improve their city.